It is said that no Food Trip to Ipoh is complete without eating the famous Big Tree Foot (Dai Shu Geok in Cantonese) at Pasir Pinji. 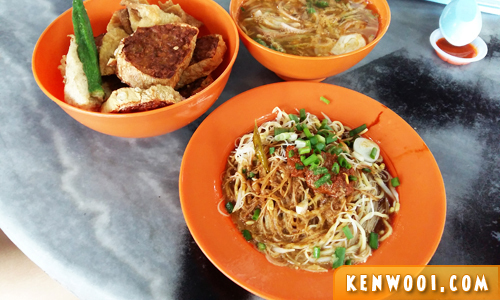 Always packed during lunch hours, this eatery in Ipoh is well-known for its fried fritters and dry curry noodles. In fact, I usually have at least one lunch at Pasir Pinji Big Tree Foot whenever I’m back in Ipoh. You may be wondering why the uncanny name, “Big Tree Foot”? Well, it got its name from its location as there is a huge tree right smack in the middle. 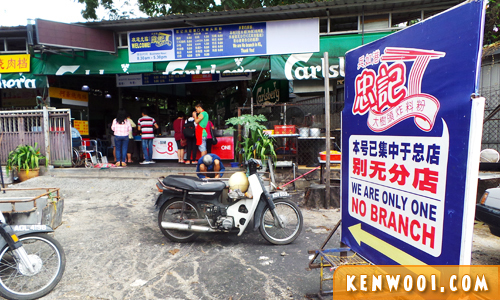 This eatery has been around for ages, and recently it switched lot with its neighbouring eatery – which sells the same type of food. So if you’re visiting Big Tree Foot today, just be sure that you’re at the right Big Tree Foot. Apparently there are various eatery elsewhere claiming themselves as branches of Big Tree Foot. 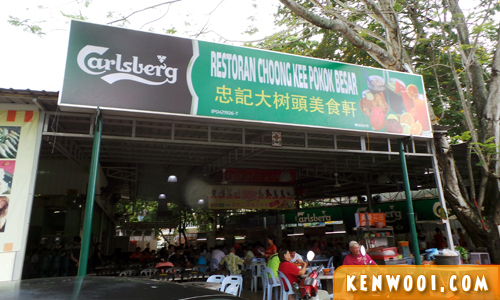 But it’s pretty clear that this is the one and only one – only available in Ipoh! The prices are pretty affordable. You may get a shock when your order arrives at your table and the worker tells you the total bill. 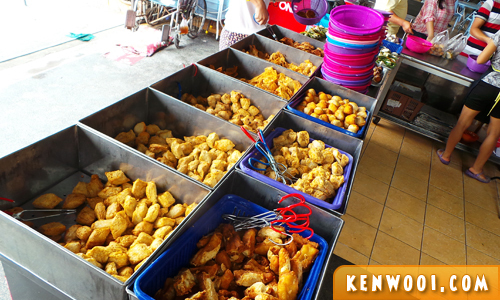 Anyway, there are a wide selection of fried fritters and they are prepared and cooked on-the-spot. 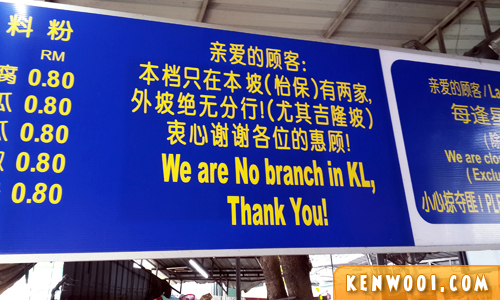 On weekends or during public holidays, there will be loads of people hogging this area to pick their fried fritters. My favourite is the Sar Kok. It’s a type of fried fritter stuffed with turnip. 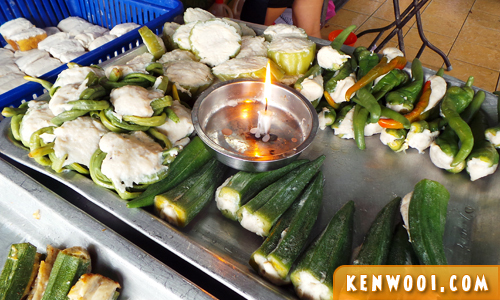 Besides the deep fried fritters, you’ll get some choices that come with soup. 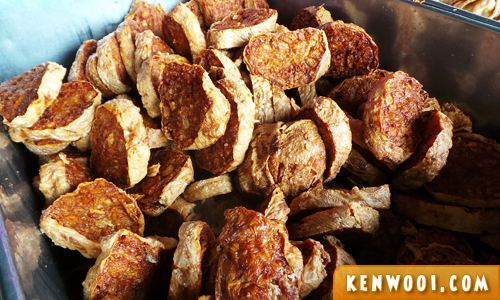 There are vegetables infused with meat/fish paste, such as brinjal and lady fingers. 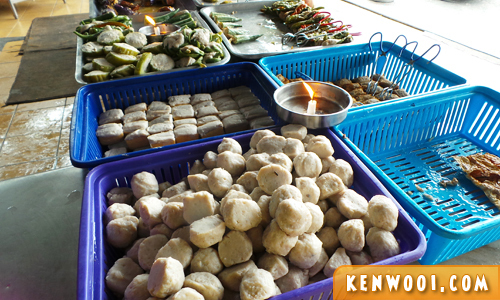 Other than that, you’ll also get to pick fish-balls and lightly deep-fried bean-curd. Customers can pick as many as they want, and then pass the basket to the lady who takes the food order. You may also opt for takeaway. After the order is taken (normally I’d order dry curry noodles), the order will be queued along with other orders that are waiting to be prepared and served. So, just head back to your table, chill and wait for the food to arrive. Oh by the way, you’ll have to get a table first because you’ll need to tell them your table number upon ordering to ease food delivery. 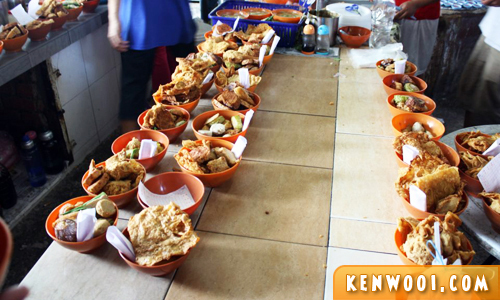 Generally, it takes about 10 to 15 minutes (depending on the crowd) for the food to arrive. You’ll need to pay when food is served. Besides the fried fritters and curry noodles, there are other food stalls within the vicinity. So feel free to explore other food choices! Miss yong tofu, none here, not the complete works. Big Tree in Ipoh, the famous place. 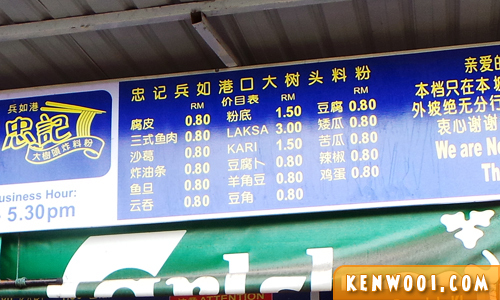 Never been – sure would love to go to Ipoh again, check all these places out, all that I have seen so often in blogs. The standard at this place had dropped so much you don’t feel like even bothered . Firstly the fried stuff are left cold and they still bothered to sell without re fry and the drinks are haphazardly prepared with the least of the quality !